One of the many topics discussed in regards to connected cars is safety. The more we rely on technology in our vehicles and feed our desire to have a constant internet connection, the easier it could be for a potential hacker to virtually plug-in to our car’s computer systems. A new report from 60 Minutes on DARPA and the ‘Internet of Things’ (internet-connected home appliances, cars, roads etc.) attempted to show just how easy it could be for a hacker to access a car’s control system through OnStar. Using a set of malicious code, DARPA was able to control a ninth-generation Imapala’s windshield wipers, brake, throttle, horn and more, all wirelessly from a laptop. As Jalopnik points out, 60 Minutes has a shoddy history when it comes to automotive reporting, but the fact that hackers can gain access to your car isn’t anything groundbreaking. Experts have warned us about this kind of thing before, but the likelihood of it happening to you is definitely up for debate. 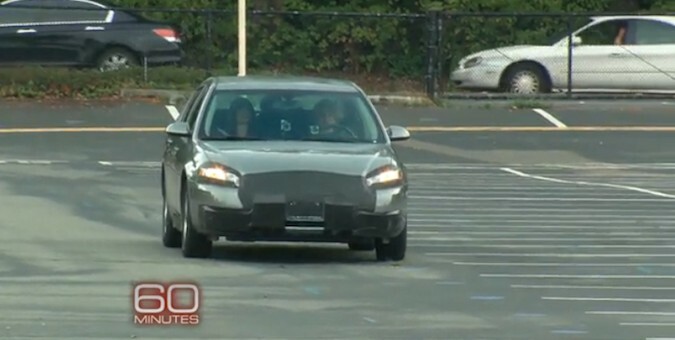 Watch as 60 Minutes demonstrates what a potential car-hacker could do if they tapped into to your GM vehicle through OnStar in the video below. Hackers have hacked into the Pentagon and all sorts of CIA agencies. Did someone actually believe a prior generation $25k Impala would be any different? In defense of 60 Minutes, the show does skew to an older demographic so I wouldn’t take it for granted that they’re as computer savvy as we are and are familiar with this weakness in OnStar. using the previous gen onstar system. Welcome to the future. Not as utopian and you expected Eh? The fact is any system that man can make can be hacked. That needs to be clear to all. Second DARPA is not exactly some capable kid in some basement somewhere. Darpa is a group that has hacked China and Russia at will so a W body Impala is not exactly a major challenge. Third if you do not want hacked keep off the grid if you can. Not easy anymore. There are now two kinds of people those who have been hacked and those who will be hacked. As long as there is good and evil in this world bad things will happen to good people that is one factor that is never going to change. As for 60 min they are here to report and sensationalize the news. Stahls work is to scare the crap out you if you are not fully informed. The odds someone will high jack your Impala are slim but yet they will still try to scare the crap out of you for February ratings. Keep in mind these are the same people who made a big deal out of the Audi unintended acceleration but never proved it really happened. The fact is you can stand on the gas to the floor but if your foot is also on the brake as claimed you will not go anywhere. There are few cars that can over come their brakes at WOT. A little something 60 min left out.